I love making baby things. If you’ve been around the blog for a while, you know that baby makes are my favorite. They work up so quickly and are simply adorable! Plus, they make great gifts and babies just look so darn cute in them. 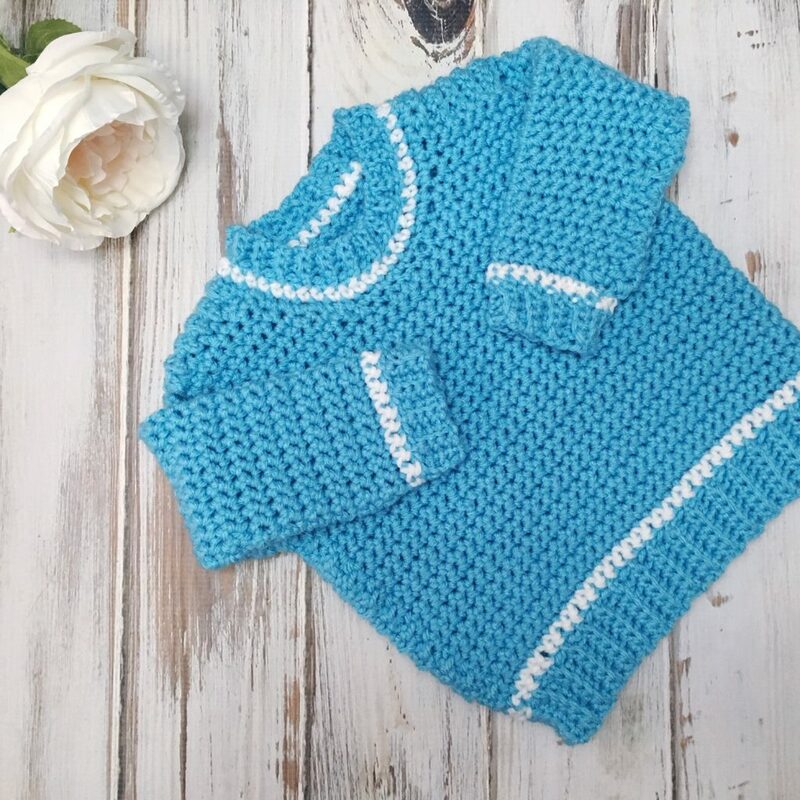 I just had to make this mini version of the popular Varsity Sweater – the Baby Ribbed Shoulder Sweater! 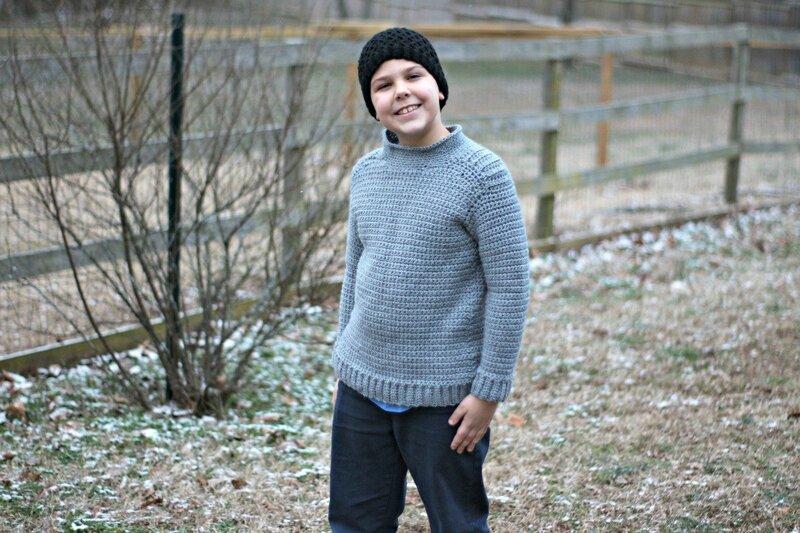 My “baby” is quickly growing up on me and isn’t really a baby anymore, but I still had him model this sweater for me. Although next time I will make it a size bigger! My boys are all big for their ages and they grow out of clothes and shoes quickly. Good thing we have plenty to hand down!! Only the oldest really “needs” new things since he has no one to hand them down to him, but the other boys get new things sometimes, too. Okay, well, new to them! We don’t buy too many brand new clothes because kids just wear them out too fast! Right now we are going through a pants destruction stage with our oldest two. 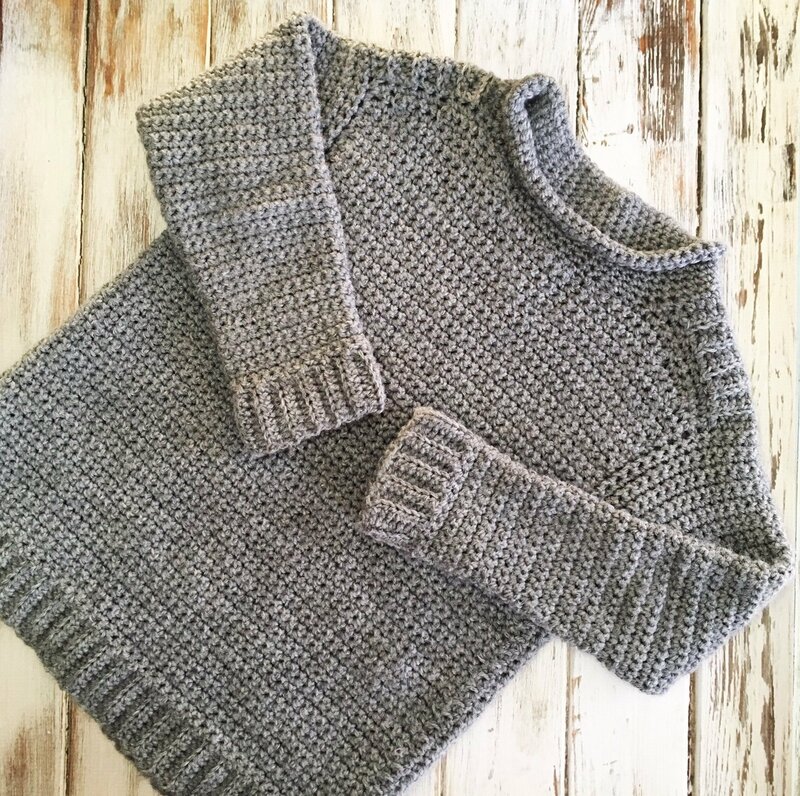 This winter I designed a sweater for all of my boys (you can check out all of those designs here) and the oldest three all received sweaters made with this technique. I really love it. The only seaming is at the ribbed edges, and some testers have said they just slip stitch that part together for NO seaming! It is worked top-down from the ribbed little panels (called Saddles) at the shoulders, then joined at the underarms to be worked in the round to the hem. Then, you crochet the sleeves in. Super simple and this worked up so amazingly fast! 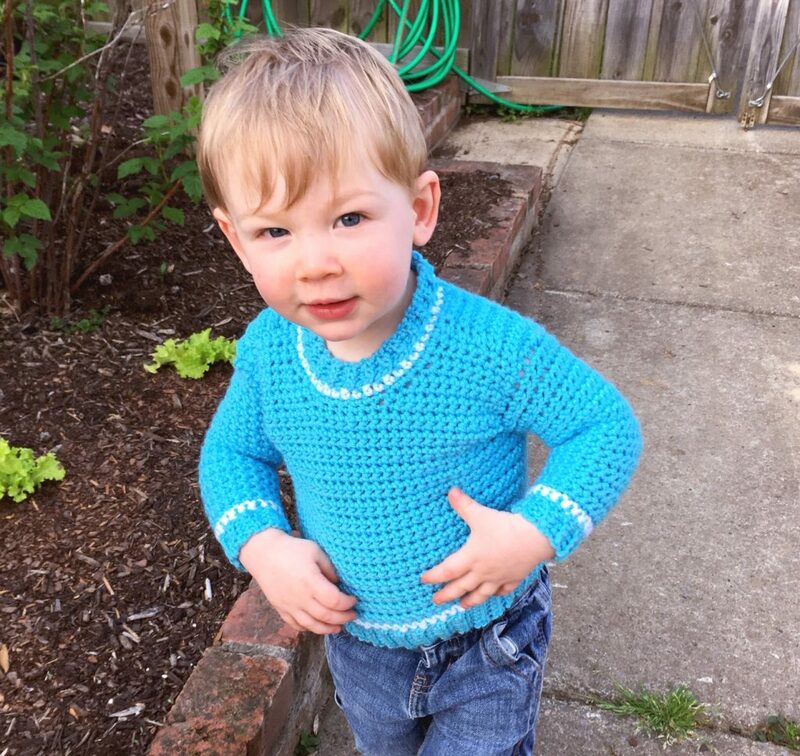 I hope you enjoy this little pattern – check out my little guy modeling it for me. 😀 I’ll definitely make him the 24 months next time. Size: Finished Chest Size 18.5 (20, 21, 22.5, 25)” to fit baby size 3 (6, 12, 18, 24) months. 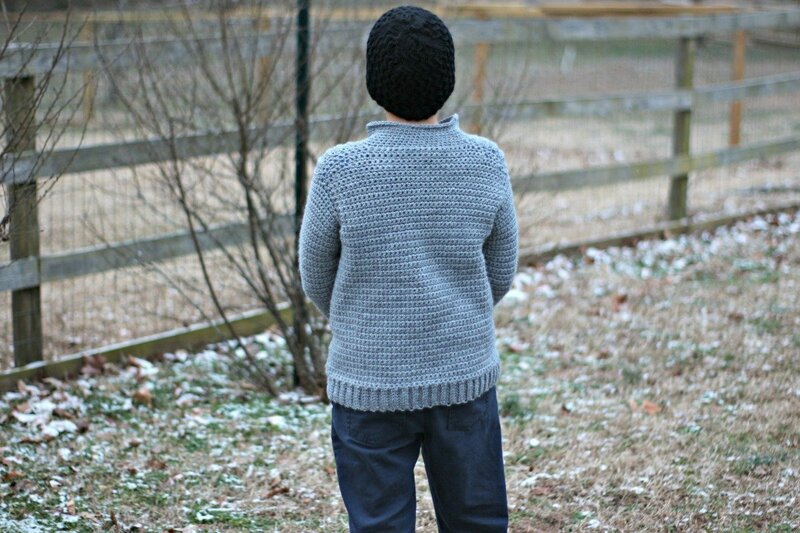 Sweater is crocheted from the top down, starting with the ribbed saddles at the shoulders. The back is worked across the saddles to the armholes, then the front is worked to the armholes and the pieces are joined. Sleeves are crocheted around armhole edges, leaving only the ribbing to be seamed. Blo: Work into the back loop only of the indicated stitch. With MC and smaller hook, ch 7. Row 1 (RS): Sc in 2nd ch from hook and in each ch across; turn – 6 sc. Row 2: Ch 1, sc blo in each sc across; turn. Rep Row 2 until Saddle measures 2 (2, 2.5, 2.5, 3)” from beginning. Do not turn at end of last row. Fasten off at end of first saddle. At end of second saddle, change to larger hook. Row 1: Ch 1, sc 6 (6, 8, 8, 10) sts evenly across second saddle, ch 10 (12, 10, 12, 10) for back neck, sc 6 (6, 8, 8, 10) sts evenly across long side of first saddle, turn – 22 (24, 26, 28, 30) total sts. Work even in sc until piece measures 3.5 (4, 4.5, 4.5, 5)” from center of saddle – NOT center back. Row 1: Ch 3, sc in 2nd ch from hook and next ch, sc to end, turn – 24 (26, 28, 30, 32) sts. Row 2: Repeat row 1 – 26 (28, 30, 32, 34) sts. Row 1: With RS facing, MC and larger hook, sc 6 (6, 8, 8, 10) sts across right saddle edge opposite back, beginning at armhole edge, turn – 6 (6, 8, 8, 10) sts. Work 2 (2, 3, 3, 4) rows even in sc. Row 4: Ch 1, 2 sc in first st, sc to end; turn – 7 sts. Row 5: Ch 1, sc to last st, 2 sc in last st; turn – 8 sts. Fasten off. Work left front. Row 6: Repeat row 4 – 9 sts. Do not fasten off. Continue to front joining row. Row 5: Ch 1, sc to last st, 2 sc in last st; turn – 9 sts. Row 6: Ch 1, 2 sc in first st, sc to end; turn – 10 sts. Row 7: Repeat row 5 – 11 sts. Row 8: Repeat row 6 – 12 sts. Row 6: Ch 1, 2 sc in first st, sc to end; turn – 11 sts. Row 7: Ch 1, sc to last st, 2 sc in last st; turn – 12 sts. Row 8: Repeat row 6 – 13 sts. Row 1: With RS facing, MC and larger hook, sc 6 (6, 8, 8, 10) sts across left saddle edge opposite back, beginning at neck edge, turn – 6 (6, 8, 8, 10) sts. Row 4: Ch 1, sc to last st, 2 sc in last st; turn – 7 sts. Row 5: Ch 1,2 sc in first st, sc to end; turn – 8 sts. Fasten off. Work right front. Row 5: Ch 1, 2 sc in first st, sc to end; turn – 9 sts. Row 6: Ch 1, sc to last st, 2 sc in last st; turn – 10 sts. Row 6: Ch 1, sc to last st, 2 sc in last st; turn – 11 sts. Row 7: Ch 1, 2 sc in first st, sc to end; turn – 12 sts. Front Joining Row: Ch 1, sc 8 (9, 11, 12, 13), ch 6 (6, 4, 4, 4) for front neck, sc 8 (9, 11, 12, 13) sts of other front, turn – 22 (24, 26, 28, 30) sts. Work even in sc until same length as back before armhole shaping. Work armhole shaping same as back. Do NOT fasten off front. Round 1: Ch 1, sc across front, ch 2, sc across back, ch 2, join to first sc with slip st, turn – 56 (60, 64, 68, 72) sts. Round 2: Ch 1, work even in sc, join to first sc with slip st, turn. Repeat round 2 until lower body measures 3.5 (4, 4, 5, 5.5)” from joining round. Work 1 round in CC. Change to smaller hook and MC. Row 1: Sc in 2nd ch from hook and next 4 sts, sc2tog next ch and next sc of body, slip st in next st of body; turn – 6 sts. Row 2: Ch 1, sc blo in each st; turn. Row 3: Ch 1, sc blo to last st, sc2tog blo of next sc and body, slip st in next st of body, turn. Repeat rows 2-3, working row 3 into every other sc of body (the sts that you do not slip st into). If ribbing seems to flare out, you have made your rows too close together. With RS facing and larger hook, join yarn at center underarm stitch. Round 1: Ch 1, sc 22 (24, 28, 28, 30) sts evenly around armhole edge, turn – 22 (24, 28, 28, 30) sts. Rounds 2-4: Ch 1, work even in sc, join with slip st to first sc, turn. Round 5 (Dec round): Ch 1, sc2tog, sc to last 2 sts, sc2tog – 20 (22, 26, 26, 28) sts. Rows 6-8: Ch 1, work even in sc, join with slip st to first sc, turn. Round 9 (Dec round): Repeat round 5 – 18 sts. Rounds 10-17: Repeat rounds 6-9 – 16 sts. Rounds 18-19: Ch 1, work even in sc, join with slip st to first sc, turn. Rows 6-9: Ch 1, work even in sc, join with slip st to first sc, turn. Round 10 (Dec round): Repeat round 5 – (20, 24, 24, 26) sts. Rounds 11-20: Repeat rounds 6-10 – (16, 20, 20, 22) sts. Round 21: Ch 1, work even in sc, join with slip st to first sc, turn. Round 22: Repeat round 5 – 18 sts. Rounds 21-24: Ch 1, work even in sc, join with slip st to first sc, turn. Round 25: Repeat round 5 – 18 sts. Round 25: Repeat round 5 – 20 sts. Rounds 26-27: Ch 1, work even in sc, join with slip st to first sc, turn. Work one round in CC. Change to smaller hook and MC. Row 1: Sc in 2nd ch from hook and next 2 sts, sc2tog next ch and next sc of body, slip st in next st of body; turn – 4 sts. With RS facing and larger hook, join CC with sl st at right back, directly behind saddle. Work 1 round even in sc. Change to MC and smaller hook. Row 1: Sc in 2nd ch from hook and next st, sc2tog next ch and next sc of body, slip st in next st of body; turn – 3 sts. Sew ribbing seams at sleeves, collar and hem. 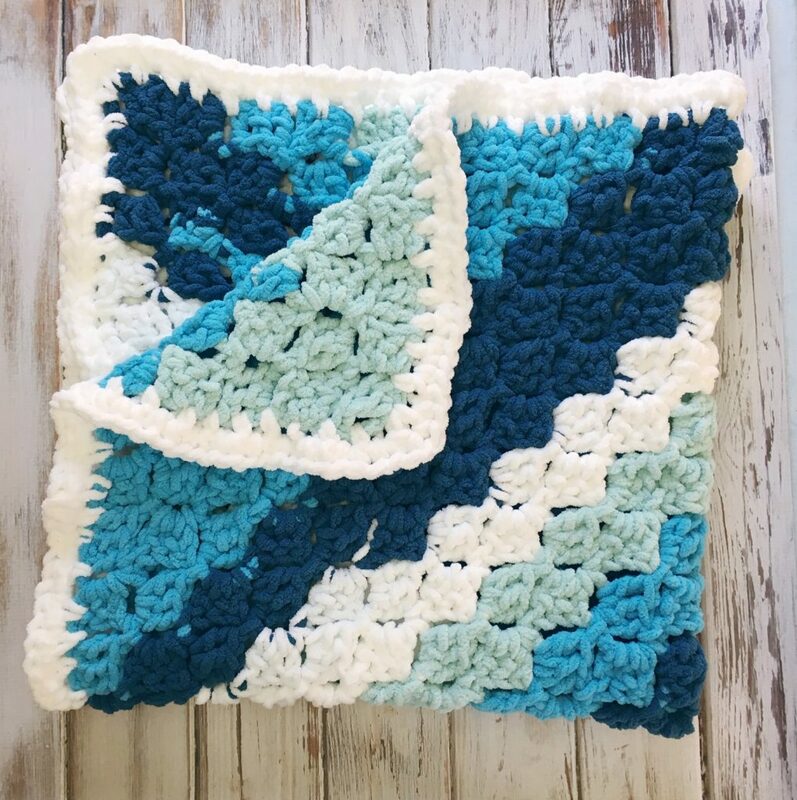 I love making baby blankets. Especially when they are made with super bulky yarn and work up in a weekend!! That’s exactly how this pattern is, and the Bernat Blanket Stripes yarn even does the color changing for you. Win-win! 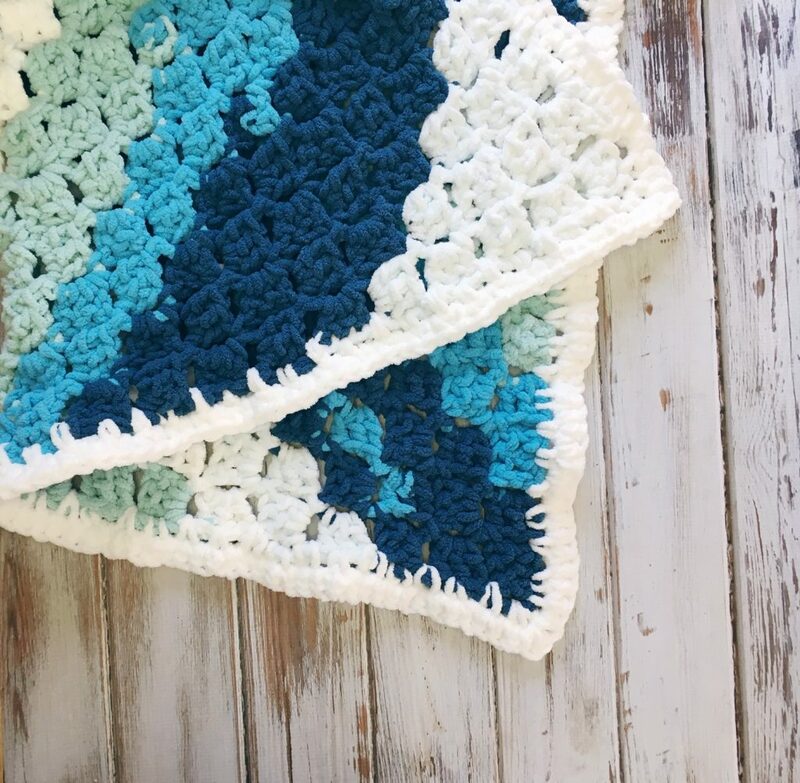 Baby blankets are by far the most popular category year-round on my blog. So much so that I’ve decided to start creating a lot more baby items: blankets, booties, sweaters, hats, etc. I love baby makes! Even though we are done having babies in this house (4 boys is enough and the youngest is still under 1 1/2!) baby makes are my favorites. 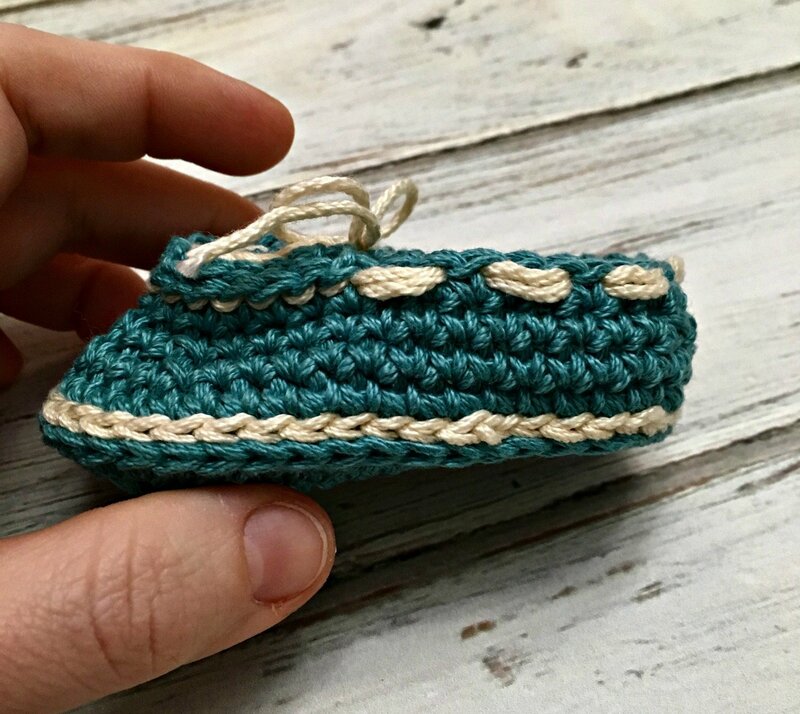 I usually always know someone I can make a baby gift for so it’s easy to find a baby to gift these to. Row 1: Dc in 4th ch from hook and next 2 ch; turn – 1 block made. Row 2: Ch 6, dc in 4th ch from hook and next 2 ch, (sl st, ch 3, 3 dc) in next ch-3 sp; turn – 2 blocks made. Row 3: Ch 6, dc in 4th ch from hook and next 2ch, (sl st, ch 3, 3 dc) in all ch-3 spaces of previous row; turn. Rows 4-21: Repeat row 3. Each row should increase one block until there are a total of 21 blocks. Row 22: Sl st in 3 dc, (sl st, ch 3, 3 dc) in next ch-3 sp of previous row to last ch-3 sp, sl st in last ch-3 sp; turn – do not make a block in the last space. Rows 23-43: Repeat row 22, ending with last block as row 43. Round 1: *Sc in space between blocks, sc along side of next block; repeat from * to corner, work (sc, ch 1, sc) in corner; repeat from * around to beginning, slip st in first sc. Do not turn. Round 2: Ch 1, sc in same sc and each sc around, working (sc, ch 1, sc) in each corner. That’s it! You’re done! 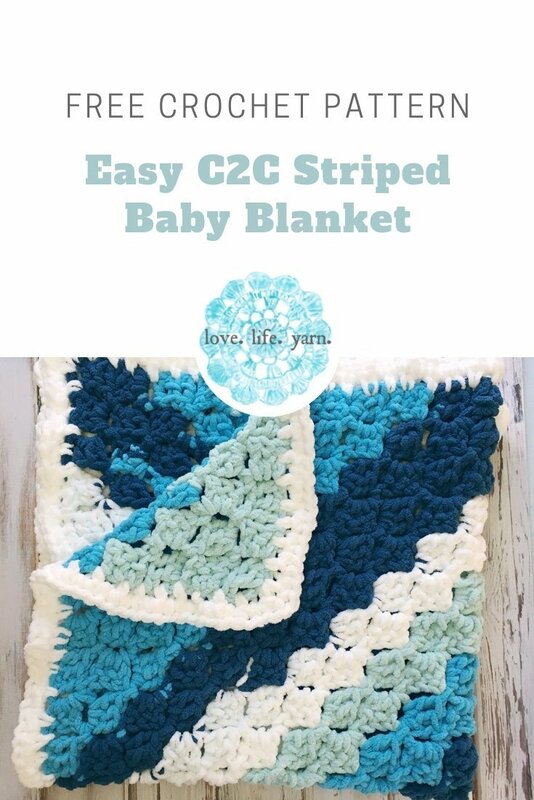 I love C2C crochet and this self striping yarn made it even easier – with fewer ends to weave in. 🙂 Always a plus, right? If you read my post about the Velvet Mittens, you will know that I was determined not to jump on the velvet yarn bandwagon. I decided it was a trend that would go out and I wasn’t going to even bother. When my son and I went to our local JoAnn to pick up some Red Heart Hygge, we found out they were out of every color that I might want to make a sweater in. And I was determined to make a sweater for me! You see, I’ve made a lot of sweaters over the years. Long sleeve, short sleeve, pullovers and cardigans. Thick yarn, thin yarn, pretty much anything. But I always made those sweaters for publication and even if I got them back they were usually a size small (which I’m not!). 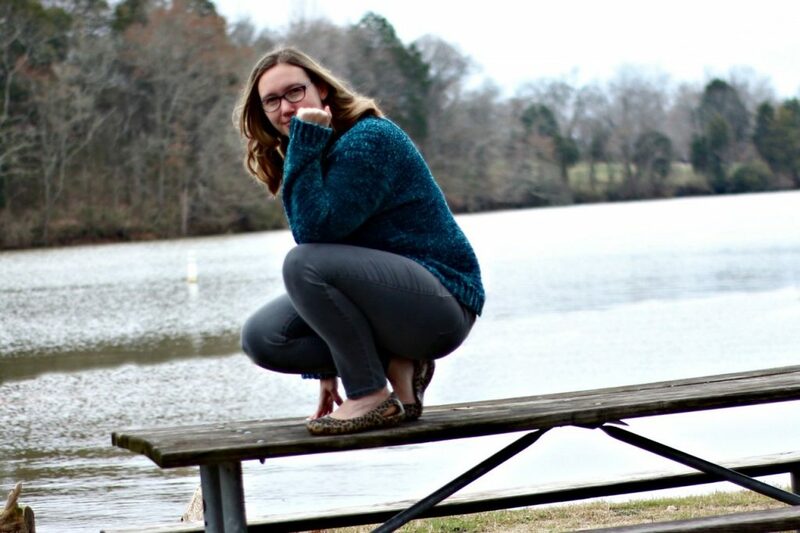 So I was determined that this time I would make a sweater just for me. I wasn’t really sure what size I was now that I’m done having kids so I made this really oversized – I ended up with 6″ ease!! But I really like it this way. I think a velvet cardigan is in order soon. My son picked up this yarn and said “Mom, it’s so soft!” and when I saw it was in teal, well, I was sold! I bought enough for my sweater (on sale even!!) and off we went. The rest is history. 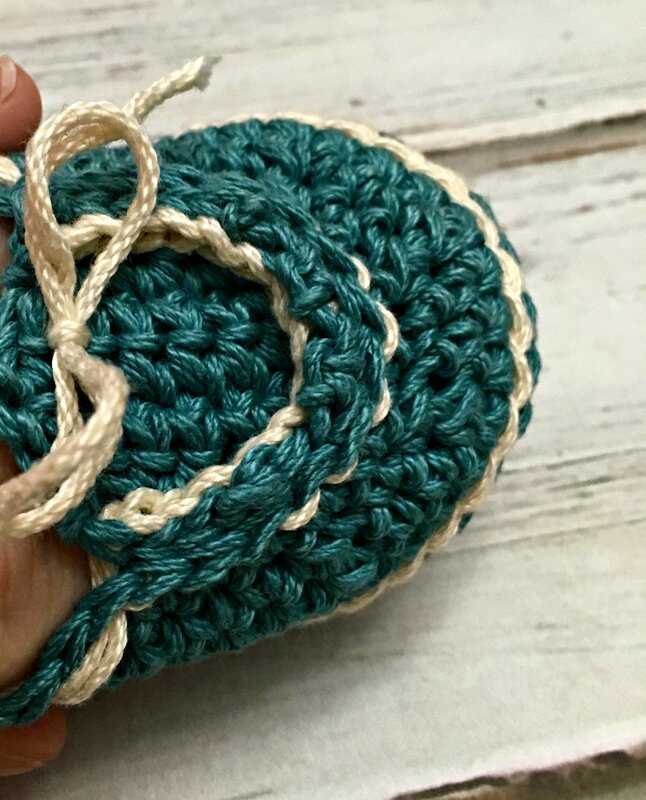 This yarn can and has been made in other bulky weight yarns – it’s not just for velvet!! I found that I could get gauge with Lion Brand Color Made Easy and I’m sure other bulky weight yarns would be the same. 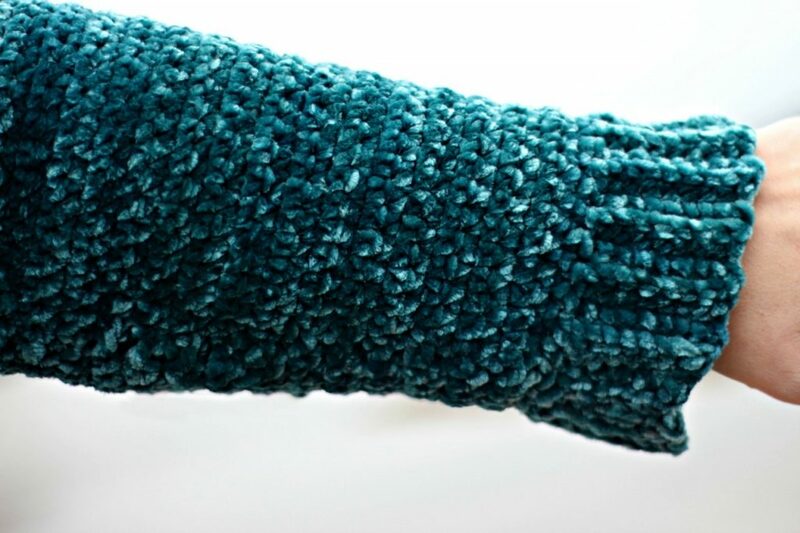 If you like the design but don’t think velvet yarn is for you – just try a bulky weight yarn and you’re good to go! Size: Finished Chest Size 36 (40, 42, 44, 46, 50, 54)” to fit women’s size XS (S, M, L, XL, 2XL, 3XL). 2-6” positive ease recommended. Shown in size XL on a model with a 40” bust. Sweater is crocheted from the top down, starting with the ribbed saddles. The back is worked across the saddles to the armholes, then the front is worked to the armholes and the pieces are joined. Sleeves are crocheted around armhole edges, leaving only the ribbing to be seamed. Alternatively, you can slip st the ribbed edges together going through one loop of each side. Ch 11 (11, 11, 11, 11, 11, 13). Row 1 (RS): Sc in 2nd ch from hook and in each ch across, turn – 10 (10, 10, 10, 10, 10, 12) sts. Row 2: Ch 1, sc blo in each sc across. Rep Row 2 until Saddle measures 3 ½ (4, 4 ½,4 ¾, 5, 5, 5 ¼)” from beginning, ending with WS row. Do not turn at end of last row. Fasten off at end of first saddle. At end of second saddle, continue working back. Row 1: Ch 1, sc 10 (12, 14, 14, 15, 15, 16) evenly across second saddle, ch 20 (20, 20, 20, 22, 24, 26) for back neck, sc 10 (12, 14, 15, 15, 15, 16) sts evenly across long side of first saddle; turn – 40 (44, 48, 48, 52, 54, 58) total sts. Row 2: Ch 1, sc across each st and ch; turn. Work even in sc until piece measures 4 ¾ (5, 5, 5, 5, 5, 5)” from edge of saddle (joining row). Row 1: Ch 1, 2 sc in first st, sc to last st, 2 sc in last st; turn – 42 (46, 50, 50, 54, 56, 60) sts. Row 2: Ch 1, sc evenly across; turn. Repeat rows 1-2 1 (2, 2, 3, 3, 4, 4) more times – 44 (50, 54, 56, 60, 64, 68) sts. Row 7: Ch 3, sc in 2nd ch from hook and next ch, sc across; turn – 46 (52, 56, 58, 62, 66, 70) sts. Row 8: Repeat row 7. Fasten off – 48 (54, 58, 60, 64, 68, 72) sts. Row 1: With RS facing, sc 10 (12, 14, 14, 15, 15, 16) sts across right saddle edge opposite back, beginning at armhole edge, turn – 10 (12, 14, 14, 15, 15, 16) sts. Row 2: Ch 1, sc evenly across, turn. Row 3: Ch 1, sc to last st, 2 st in last st – 11 (13, 15, 15, 16, 16, 17) sts. Repeat rows 2-3 4 (4, 4, 3, 4, 4, 5) more times – 15 (17, 19, 18, 20, 20, 22) sts. Row 1: With RS facing, sc 10 (12, 14, 14, 15, 15, 16) sts across left saddle edge opposite back, beginning at neck edge; turn – 10 (12, 14, 14, 15, 15, 16) sts. Row 3: Ch 1, 2 sc in first st, sc to end; turn – 11 (13, 15, 15, 16, 16, 17) sts. Do not fasten off. Turn and continue working front joining row. Row 5: Ch 1, sc across left front, ch 10 (10, 10, 12, 12, 14, 14) for front neck, sc across right front; turn – 40 (44, 48, 48, 52, 54, 58) sts. Row 8: Repeat row 7. Do not fasten off. Turn and work lower body section – 48 (54, 58, 60, 64, 68, 72) sts. Round 1: Ch 1, work 48 (54, 58, 60, 64, 68, 72) sts across front, ch 6 (6, 6, 6, 6, 8, 10), work 48 (54, 58, 60, 64, 68, 72) sts across back, ch 6 (6, 6, 6, 6, 8, 10), join to first sc with slip st, turn – 108 (120, 128, 132, 140, 152, 164) sts. Repeat round 2 until lower body measures 12 (12 ½, 12 ½, 13, 13, 14, 14 ¾)” from joining round. Ch 9 (9, 9, 9, 11, 11, 11). Row 1: Sc in 2nd ch from hook and next 6 (6, 6, 6, 8, 8, 8) ch, sc2tog next ch and next sc of body, slip st in next st of body, turn – 8 (8, 8, 8, 10, 10, 10) sts. Row 2: Ch 1, sc blo in each st, turn. Row 3: Ch 2, sc blo to last st, sc2tog blo of next sc and next st of body, slip st in next st of body, turn. With RS facing, join yarn at center underarm stitch. Round 1: Ch 1, sc 40 (42, 44, 44, 44, 46, 48) sts evenly around armhole edge, join with sl st to first sc; turn – 40 (42, 44, 44, 44, 46, 48) total sts. Round 2: Ch 1, work even in sc, join with slip st to first sc, turn. Rounds 3-6: Repeat round 2. Round 4: Ch 1, sc2tog, sc to last 2 sts, sc2tog – 38 (40, 42, 42, 42, 44, 46) sts. Rounds 1-8: Repeat round 2. Round 9: Ch 1, sc2tog, sc to last 2 sts, sc2tog – 36 (40, 40, 42) sts. Repeat rows 1-9 4 (5, 5, 5) more times – 28 (30, 30, 32) sts. Rounds 1-9: Repeat round 2. Round 10: Ch 1, sc2tog, sc to last 2 sts, sc2tog – 38 (40, 44) sts. Repeat rounds 1-10 4 (4, 5) more times – 30 (32, 34) sts. Work even if needed until sleeve measures 13 ½ (14 ¼, 14 ½,15, 15 ¼, 16 ¼, 16 ¼)” from first round of sleeve. Work same as body ribbing. With RS facing, join yarn with sl st at right back, directly behind saddle. Ch 1, sc evenly around neck edge. Row 1: Sc in 2nd ch from hook and next 4 ch, sc2tog next ch and next sc of body, slip st in next st of body, turn – 6 sts. Repeat rows 2-3, working row 3 into every other sc of body (the sts that you do not slip st into). 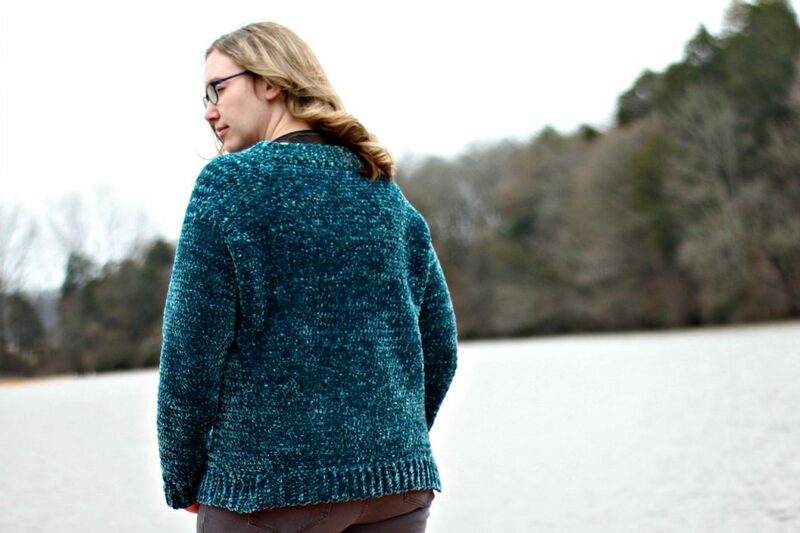 If ribbing seems to flare out, you have made your rows too close together. If this happens, take out the collar and make your first row of sc more evenly spaced apart, then try the ribbing again. It’s been a while since I designed a pair of baby booties but I really love them. I’m planning a lot more baby projects over the spring and summer months. 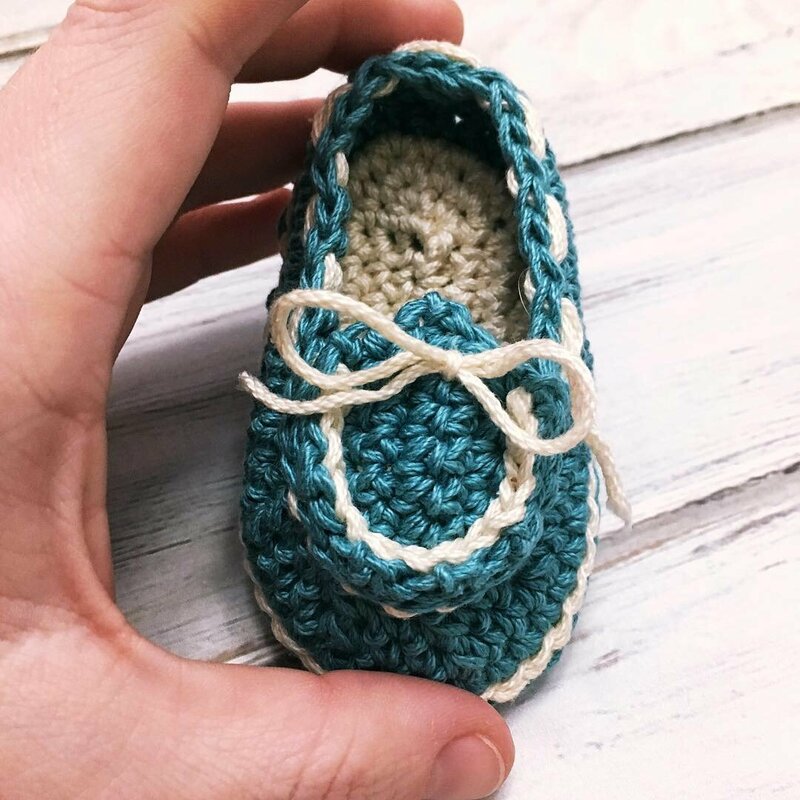 Baby booties and blankets are really timeless and I find that a lot of people enjoy making them year-round, whereas other projects (such as mittens and hats) come and go with cold weather – understandably so. I designed these booties using Lion Brand 24/7 Cotton and really enjoyed using this yarn. I like cotton yarns a lot and they were really the first yarns I started using a looooong time ago after I switched from some super cheap acrylic. 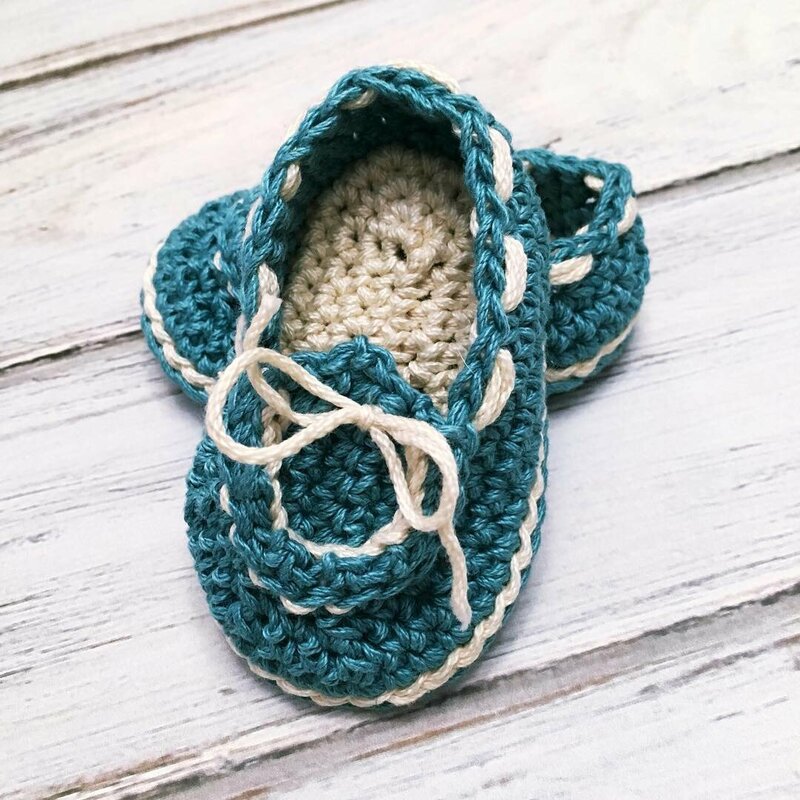 For these, I use the same sole construction that I’ve used for several other booties on the site: Sweet Sophisticated Mary Janes, Basic Baby Booties, and Sweetheart Baby Shoes, just to name a few. 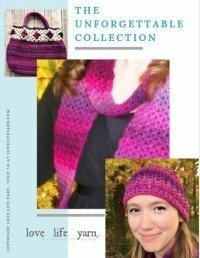 If you want to view all my free crochet patterns, you can check out the library of patterns here. Yarn: Lion Brand 24/7 Cotton (100% Cotton; 186 yards [170 meters]/100 grams): 178 Jade (MC), 1 ball; 98 Ecru (CC) 1 ball. To work an invisible join when joining sc: Cut yarn and pull through center of last st made (do NOT fasten off the regular way). Insert hook from right to left in 2nd st to left and pull yarn through. Insert hook from right to left in the middle of the last st made (the one you pulled the yarn through initially) and pull yarn down through the middle of this stitch. See video tutorial here. To work an invisible join when joining slip sts: Cut yarn and pull through center of last st made (do NOT fasten off the regular way). Insert hook from right to left under both loops of next slip st to the left and pull yarn through. Insert hook from right to left in the center of the last slip st and pull yarn down through center of last slip st. See video tutorial here. I’m so excited that I met my big crochet goal for the season! I really wanted to make all four boys a sweater this winter and this is the last one – and there is still plenty of cold weather left for them to wear them!! 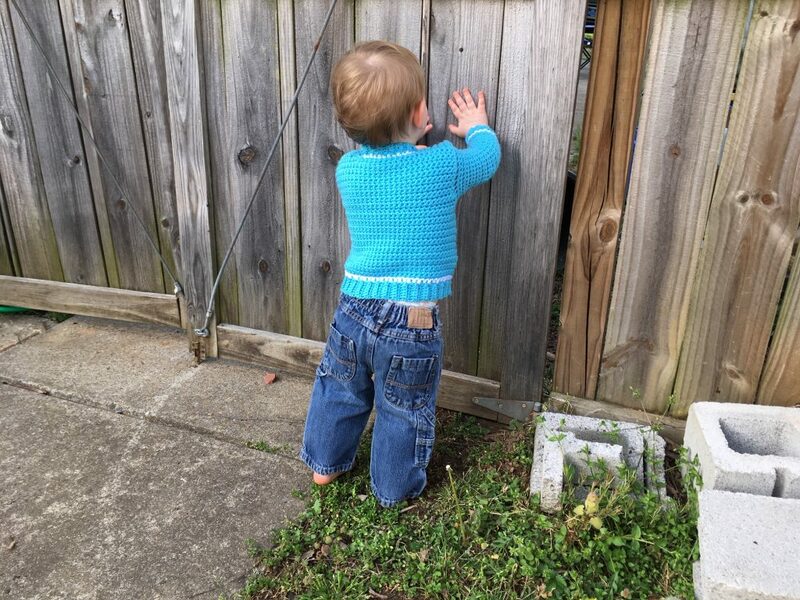 I started out making the youngest a Cabled Hoodie, then I made the three-year-old a V-Neck version of this sweater, then the six-year-old got a Crew Neck version of this sweater, and now my oldest wanted his all in one color with a funnel neck. Whew!! It’s been busy but I love all of these. I’m going to try to get some pictures of all four of them together in their sweaters. 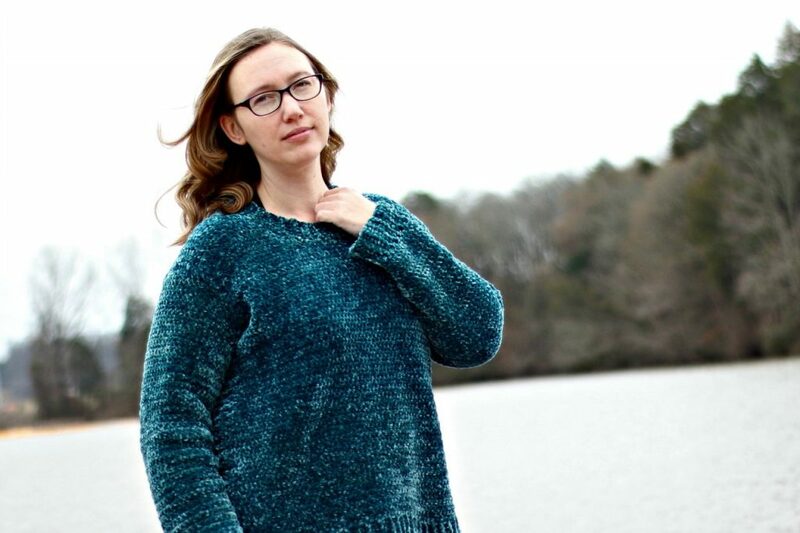 This sweater uses Lion Brand yarn’s Pound of Love, which retails at Michael’s for $9.99. 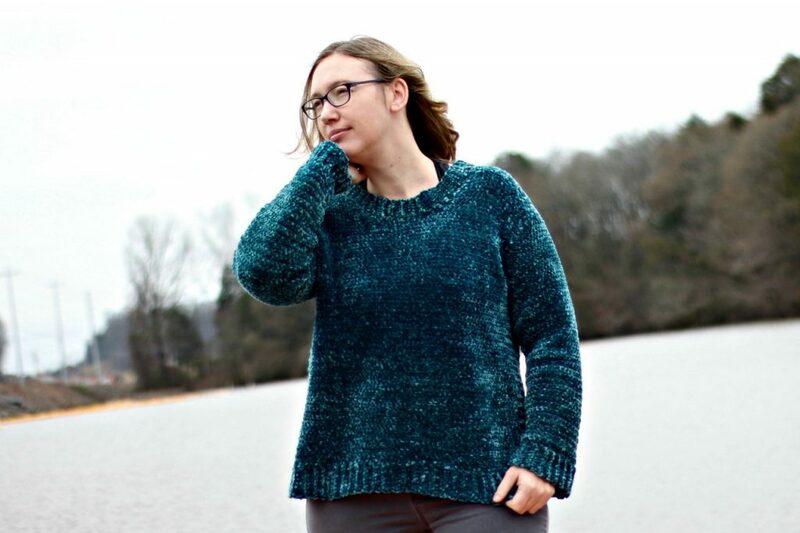 I had a 50% off coupon and made this entire sweater (with a good amount left over) for only $5!! And this is the largest size!! I’m working on an adult version now that is almost done and I made it in the velvet yarn…. I’m so in love. And making all these sweaters has rekindled my love of making sweaters, so be on the lookout for more sweaters really soon! Size: Finished Chest Size 26 (28, 30, 32, 34)” to fit kid’s size 4 (6, 8, 10, 12). 2” positive ease recommended. Shown in size 12. Sweater is crocheted from the top down, starting with the ribbed saddles. The back is worked across the saddles to the armholes, then the front is worked to the armholes and the pieces are joined. 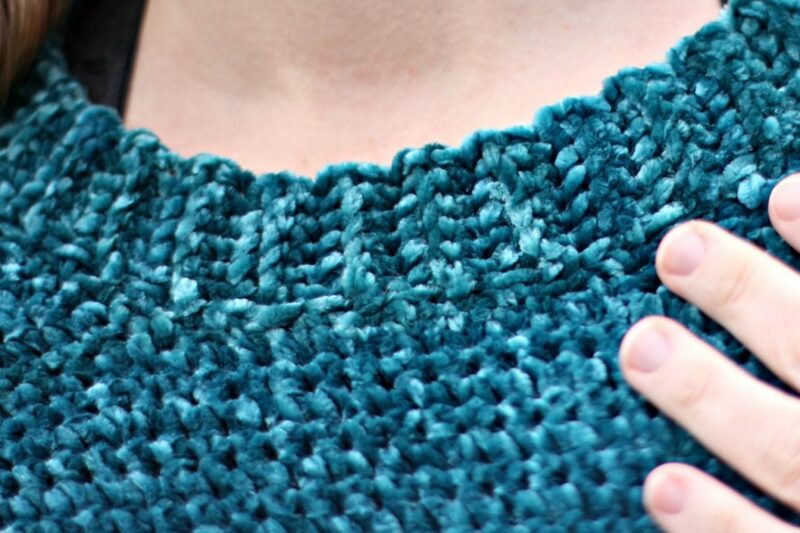 Sleeves are crocheted around armhole edges, leaving only the ribbing to be seamed. Shoulder shaping is achieved using short rows. When working back across the row, sc in the next st as usual. After a few more rows it should lie relatively flat. Ch 2 at beginning of a row counts as hdc. With smaller hook, ch 7 (9, 9, 11, 11). Row 1 (RS): Hdc in 3rd ch from hook and in each ch across, turn – 6 (8, 8, 10, 10) sc. Row 2: Ch 2, hdc blo in each hdc across, working last st into ch-2, turn. Rep Row 2 until Saddle measures 2 ½ (2 ¾, 2 ¾, 3, 3 ½)” from beginning, ending with WS row. Do not turn at end of last row. Fasten off at end of first saddle. At end of second saddle, change to larger hook. Row 1: Ch 1, sc 8 (8, 9, 9, 10) evenly across second saddle, ch 14 (16, 18, 18, 18) for back neck, sc 8 (8, 9, 9, 10) sts evenly across long side of first saddle, turn – 30 (32, 36, 36, 38) total sts. Row 2: Ch 1, work even in sc. Row 3 (Begin shoulder shaping): Ch 1, sc 25 (27, 31, 31, 32), turn, leaving remaining sts unworked. Row 4: Ch 1, sc 20 (22, 26, 26, 26), turn, leaving remaining sts unworked. Row 5: Ch 1, sc 23 (25, 29, 29, 30), turn, leaving remaining sts unworked. Row 6: Ch 1, sc 26 (28, 32, 32, 34), turn, leaving remaining sts unworked. Row 7: Ch 1, sc 28 (32, 34, 34, 36), turn, leaving remaining sts unworked. Row 8: Ch 1, sc to end, turn. Work even in sc until piece measures 4 ¼ (5 ¼, 5 ¾, 6, 6)” from center of saddle – NOT center back. In the photo below, you can see here I am measuring the size 8. Start at the center of the saddle (you can see the brown saddle to the left). I need to work just a little longer to reach the 5 3/4″ measurement before starting the armhole shaping. Row 1: Ch 1, 2 sc in first st, sc to last st, 2 sc in last st – 32 (34, 38, 38, 40) sts. Repeat row 1 – 32 (34, 38, 40, 42) sts. Row 2: Ch 3, sc in 2nd ch from hook and next ch, sc to end – 34 (36, 40, 42, 44) sts. Row 3: Repeat row 2 – 36 (38, 42, 44, 46) sts. Row 1: With RS facing and larger hook, sc 8 (8, 9, 9, 10) sts across left saddle edge opposite back, beginning at neck edge, turn – 8 (8, 9, 9, 10) sts. Row 2: Ch 1, sc evenly across, ch 5, turn. Row 3: Sc in 2nd ch from hook and next 3 ch, sc 3 (3, 4, 4, 4), turn, leaving remaining sts unworked. Row 4: Ch 1, sc 7 (7, 8, 8, 8), turn. Row 1: With RS facing and larger hook, sc 8 (8, 9, 9, 10) sts across right saddle edge opposite back, beginning at armhole edge, turn – 8 (8, 9, 9, 10) sts. Row 3: Ch 1, sc evenly across, ch 5, turn. Row 4: Sc in 2nd ch from hook and next 3 ch, sc 3 (3, 4, 4, 4), turn, leaving remaining sts unworked. Row 5: Ch 1, sc 7 (7, 8, 8, 8), ch 6 (8, 10, 10, 10) for front neck, sc 10 (10, 11, 11, 12), turn, leaving remaining sts unworked. Row 6: Ch 1, sc 26 (28, 32, 32, 34) sts, turn, leaving remaining sts unworked. Row 7: Ch 1, sc 28 (30, 34, 34, 36) sts, turn. Row 8: Ch 1, sc 30 (32, 36, 36, 38) sts; turn. Round 1: Ch 1, work 36 (38, 42, 44, 46) sts across front, ch 4 (4, 4, 4, 6), work 36 (38, 42, 44, 46) sts across back, ch 4 (4, 4, 4, 6), join to first sc with slip st, turn – 80 (84, 92, 96, 104) sts. Repeat round 2 until lower body measures 6 ¼ (7 ¼, 8 ¾, 9 ¾, 11 ¼)” from joining round. Change to smaller hook. Ch 9 (9, 9, 11, 11). Row 1: Hdc in 3rd ch from hook and next 5 (5, 5, 7, 7), hdc2tog next ch and next sc of body, slip st in next st of body, turn. Row 2: Ch 1, hdc blo in each st, turn. Row 3: Ch 2, hdc blo to last st, hdc2tog blo of next hdc and body, slip st in next st of body, turn. Round 1: Ch 1, sc 2 (2, 2, 2, 3) sts along underarm, 9 (11, 13, 13, 12) sts to saddle edge, 6 (8, 8, 10, 10) sts of saddle, 9 (11, 13, 13, 12) sts down to base of armhole, 2 (2, 2, 2, 3) sts along underarm, join with slip st to first sc, turn – 28 (34, 38, 40, 40) total sts. Rounds 3-5: Repeat round 2. Rows 6-12: Repeat round 2. Round 13 (Dec round): Ch 1, sc2tog, sc to last 2 sts, sc2tog – 26 sts. Rounds 14-21: Repeat rounds 6-13 – 24 sts. Rounds 6-10: Repeat round 2. Round 11: Ch 1, sc2tog, sc to last 2 sts, sc2tog – 22 (32, 36, 38, 38) sts. Repeat rounds 6-11 2 (4, 5, 6, 5) times -18 (24, 26, 26, 28) sts. Rounds 1-3: Repeat round 2. Round 4: Ch 1, sc2tog, sc to last 2 sts, sc2tog – – (22, 24, 24, 26) sts. Work even if needed until sleeve measures 9 ½ (10 ¼, 11 ½, 12 ½, 13)” from first round of sleeve. Change to smaller hook. With RS facing and larger hook, join yarn with sl st at right back, directly behind saddle. Round 1: Ch 1, sc evenly around neck edge. Work even in sc for 9 more rows. Work in continuous rounds, do not join with slip st.